Home›Articles›How do I run a beatboxing workshop? 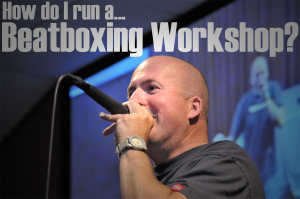 I often get asked how to run beatboxing workshops and lessons. Firstly, there is a big difference between a workshop and a lesson. Lessons are on-going, require careful planning, depend on the students, and really only work with a small group of beatboxers - usually six or less. A workshop is a specific period of time, usually between 30 and 120 minutes with a group of people who probably aren't destined to become world-famous beatboxers but who want to have fun! Workshops work better with larger groups and I have run them with as little as four people and as many as sixty! I have run beatboxing workshops in festivals, schools, companies and youth events around the UK. Before you run a workshop you need to know exactly how much time has been allocated. There is a big difference between a 30 minute and 2-hour workshop. If you are new to running workshops and you get asked how long you can do a workshop for, go for a shorter workshop. Start with 30 minutes and work your way up as you get more proficient. I get emails from people telling me they have to do a 2-hour workshop and have no idea how to fill it! The audience makes a difference. I have done workshops to pre-school kids (aged 2-4) as well as to corporate executives (aged 30-60)! You may need to tailor the content to the audience. Make sure you have the right equipment. These days, I take my own rig and microphones with me. I have a pair of Mackie SRM450s, a NuMark CD mixer and two Shure Beta58a. Two microphones is a minimum as we shall see later! Also ensure that there are enough seats for everyone and that the space is adequate for your needs. Most of the time I don't use any visual aids but occasionally I'm asked to provide PowerPoint or use a white board. Always plan to have enough content to fill the workshop and some extra content as a contingency! I have turned up to workshops and discovered that my time allocation has been extended by 10 minutes. This is a long time to keep a crowd happy if you're not prepared. You never want to leave a crows without something captivating their attention. William (Bill) Gates said this but it's true. And I guess what you really want to know is what to do! OK - here goes... I do all my workshops in modules or chunks. I can then fill the time with a specific number of these modules or chunks depending on the crowd, time and space. Welcome the crowd. Gather them around you if they are spread out. Say who you are and what the workshop is about. Watch out for late-comers and welcome them in otherwise they will hang by the door! Use the space, be confident and engage the crowd. A workshop is a performance! They are there to be entertained as well as to learn. I always start the workshop with a short performance. 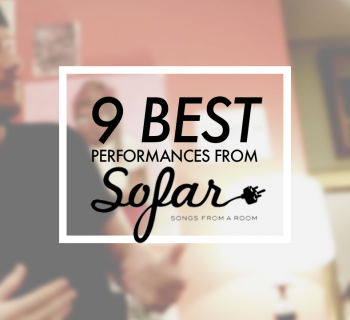 Something that has a wow factor and better still, something that engages the audience. I start my workshops by doing a heavy beat pattern, then I point my finger at members of the audience and as I do so I make a high-pitched sound. I point to different people and make different sounds with the beat continuing. Then I get to one person (usually someone in the front row who looks like they're naughty/popular or whatever) and when I point to them I make a farting sound and stop as if they have broken my finger! (Okay, so you might have to see it to fully understand) The point is that you do something that captures everyone's attention and preferably makes them laugh. This is quite a talky module so I keep it very short. It's better for more corporate workshops. 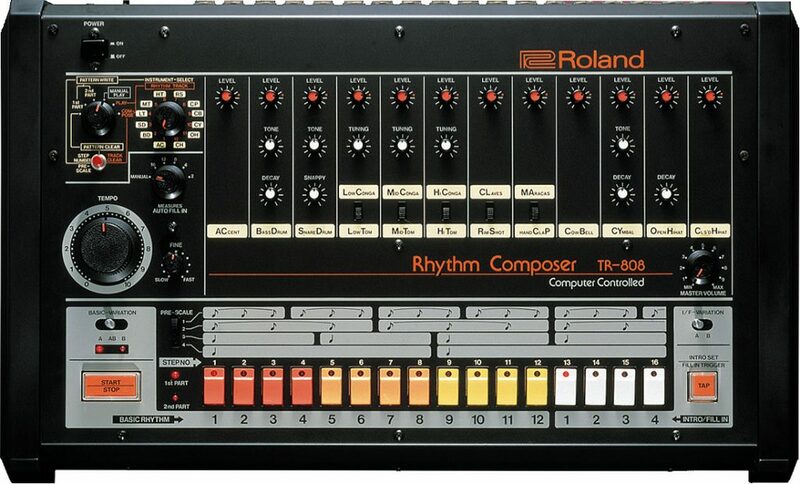 I start off with talking about what beatboxing is (beat box aka drum machine) and then go on to where it came from. Not the most exciting of modules but a good time filler. I start with Darren Robinson and give an example, then I go on to Doug E. Fresh (the clicks), and so on through to Rahzel (singing and vocal scratching), Killa Kela (drum and bass) and the Internet revolution. For this I will teach three sounds and get them to put them together to make a simple beat. These days whenever I teach people to make a sound, I get them all to shout a word. For example, "Everyone say cabbage", 'CABBAGE' "Everyone say Cabba", 'CABBA' "Everyone say Cab", 'CAB' "Everyone say Ca", 'CA' "Everyone say K", 'K' "Well done, you've all made a snare sound - give yourself a round of applause." You might think that this is silly or simple, but that's the point! It's supposed to be fun and engage everyone. You can also make jokes about people spitting on the head of the person in front, etc. Just as long as it's fun. You can choose from a range of techniques but I always teach the crowd how to do vocal scratching. Because people are going to sound silly, this always works in a crowd. You will also need it later! I get them all making 'Oowi' and 'Igada' sounds - lots of fun. 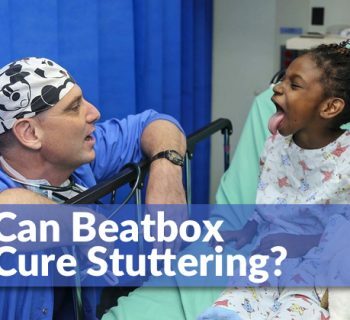 You can then teach or demonstrate some other tricks of beatboxing such as the auditory illusion, echoes or singing and beatboxing at the same time. This is where you get the crowd out and on the mic! I ask for four volunteers. Most of the time, people are eager to volunteer - especially in schools, but you might have to encourage people by offering a prize (chocolate usually works)! If possible pick a mixture of male and female, young and old. When they come out, ask them their names and get the crowd to cheer for them! Tell the crowd what we're goint to do. Split the volunteers into two pairs and ask them to come up with a crew name. Then ask them which one is going to do the beat and which one is going to vocal scratch. You may need to do some extra coaching at this point! Then run the battle like the real thing. Announce it - e.g. "Get ready for the 2006 Mayflower School Beatbox Battle". Then give each crew a few seconds to do their thing with heaps of encouragement. Then get the crowd to vote for the best crew and announce the winner. Give them ALL a prize! Above all, make it fun. This is a good time filler/contingency. Ask if anyone has any questions. Usually, someone will ask you how you did a certain sound - especially if you have a few beatboxers in the crowd. Rip up the mic with your best routines! Go out with a bang. Thank the crowd for being superb. Give them your web address, etc. 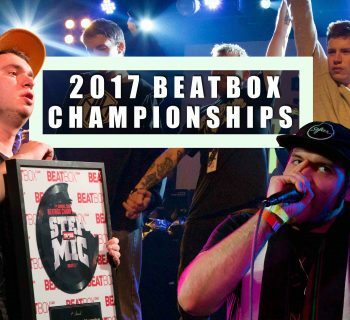 Thanks to Bee Low at Beatbox Battle Networks for the best beatboxing image base on the web. Heaps of Peace to A-Plus, Shlomo, Matt D., thePETEBOX and all the other guys I've done workshops with. A special shoutout to Hopey for kicking me up the backside and getting this article written! So helpful! Thanks a lot!